How Much is a Boat Slip? 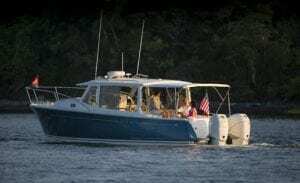 What is The Best Liveaboard Boat? Winterize Your Boat in California? Chandlery Yacht Sales is delighted to be a broker for the MJM Yacht line of fine power yachts. 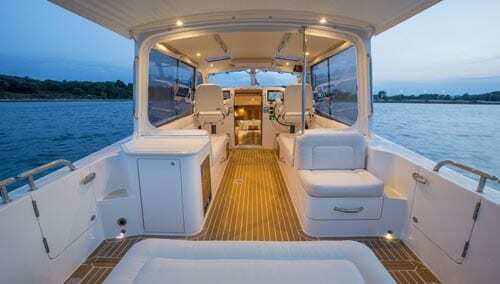 This post features the amazing MJM 35z day cruiser and will provide info on its features, specifications, and independent reviews, as well as several MJM 35z videos. MJM Yachts has quickly become a major player in the power yacht world. This is likely due to the fact that they have their roots as part of the J-Boat family and a build agreement with Boston Boat Works. The MJM 35z is a versatile 35′ power yacht families can use for both day cruising and overnight trips with comfort, ease and lots of speed. It is ISO B Certified and comes stock with twin 300HP Mercury outboards that will launch this craft to speeds in the 50mph range. The vessel is well designed with both below and above deck features designed to impress. The manufacturers like to say the below deck area is “quite civilized” and the top deck is open and ready for friends to party. Fuel Capacity – 250 gal. Fresh Water Capacity – 58 gal. Defining Luxury In the Dayboat Market. Needless to say, with no diesels and Hamilton Jet Drives under the deck, the 35z has tons of storage for all the camping, golf, bicycling, diving, fishing, and watersport equipment imaginable. On deck the MJM 35z has a familiar feeling to it, sharing many of the design and layout characteristics with the rest of the builder’s models. 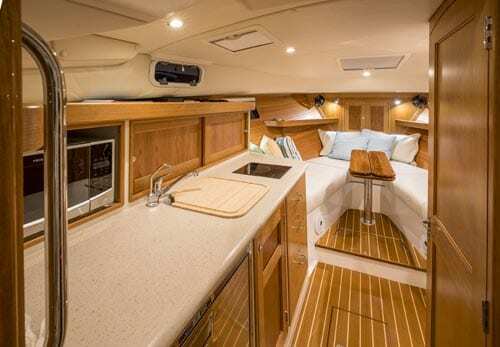 One of those design cues is a bridge deck and aft cockpit that are on a single level, from the transom all the way to the companionway that leads below decks. The transom has an open feel to it thanks to an island bench with access to the swim platform area on either side of it. Read the full review.